Stoupa villas with hot tubs, holiday cottages by the beach, rental homes with private pools, self-catering accommodation to let, rent a luxury villa for romantic holidays in Stoupa, Greece. 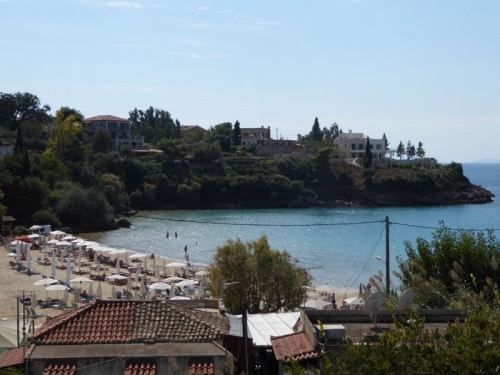 Stoupa offers sea, sun and sand holidays, ideal for families and couples both young and old. Local tavernas and restaurants serve mainly Greek food and are of a good quality. Stoupa is a great excursion point. You can visit most of the archaeological sites of the Peloponnese (Olympia, Mistras, Diros caves, Monemvasia etc) on a day trip. Also, it is a 2hrs drive away from the new golf courses in Costa Navarino. It is possible to rent a car locally or book such an excursion. Other than that, there is a good choice of walking paths by the sea, on the slopes above Stoupa or in the gorges. Local agencies organise guided walks around the area of Stoupa. The Mani region where Stoupa is situated has a long and interesting history and the local architecture, even quite recent, has its roots in the past. We have 13 villas in Stoupa. Recommended to people who want quiet holidays in May, June and September which are really peaceful. There are a number of well-stocked supermarkets and everything is within reasonable walking distance, you don't really need to go elsewhere to eat out, enjoy a drink in a bar and self-cater. There are lovely, easy walks along the coast as well as designated cycle lanes which are a delight in the warm evenings. The coastline is dominated by high mountain scenery and the vegetation is lush and tropical, it is a place of great natural beauty. 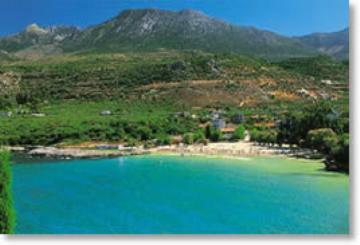 Stoupa is a charming, friendly, small seaside village in the south Peloponnese in Greece. Sandy beaches and shallow waters make this an ideal family destination and you have the main village beach and another sandy bay too. The nearest airport to Stoupa is Kalamata International (KLX) which lies 54 km to the west and is serviced with direct flights by Easyjet and British Airways. Athens International airport (ATH) is 312 km and takes around three and a half hours to drive though as most of it is motorway it is fairly easy to do. Athens is serviced with direct flights by Easyjet and Ryanair. The climate in Stoupa is lovely and warm for much of the year and whilst the mountains do attract some clouds the sun still shines on the beach. In July and August, it invariably gets quite hot but the rental houses are well designed and insulated and there is usually air conditioning just in case. The Spring period of April, May and June is very nice indeed and the long sunny days with warm balmy evenings are just perfect. Even in September and October, the warmth remains so the holiday season is relatively long.